The Troia font family is a beautiful font available in three weights; normal and italic. 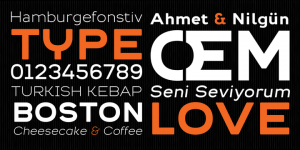 One of the best things about the font is its rounded corners, each weight comes with its own smoother version. The major attraction of this font is the large letters. Other amazing features include the added spaces between the letters which makes it unique. Troia can be used to get flawless effects and create great works including banners, logos, typography, t-shirts, texts, and printings. The font is an ideal choice for creating presentations.Writing enthusiasts will benefit from Troia’s exquisite and exotic that allows them indulge in pleasant writing projects.